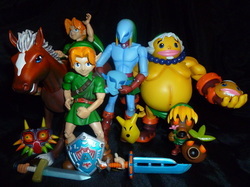 A majority of this collection consists of larger action figures from the Zelda franchise. This will also include pieces (such as Joy Ride Link) because I consider these types of pieces as figures rather than statues because of their posability. Other Info: The retail version of these figures also included a mossy stone/brick circle base. 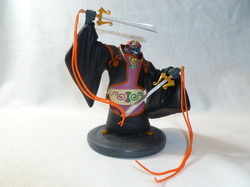 The figures have various accessories, such as: The Kokiri Sword (Majora's Mask version), the Razor Sword, the Hero's Shield, Large Zora Fins, Small Zora Fins, Deku Mask, Zora Mask, Goron Mask, Keaton Mask, and the Majora's Mask. The original auction listing read: "The Legend of Zelda Majora's Mask Set of 5 Link Figures - Loose Preproduction Sample Up for auction is a near mint in bag Set of 5 Link figures from Epoch. Made in Japan in 2001, these figures were very hard to come by and is now seldom seen on eBay. This was release over 10 years ago and I came across this set from another collector who told me that these were Preproduction samples that he got from a Sales rep and this is why they came in poly bags. I never saw them inside the blister card and received them the way you see them in the photos, just in poly bags. I have had it in storage all this time. The loose figures you see with the the accessory is exactly what you will be getting. It has all of the 5 mask still in the poly bag and comes with 2 Links, the standing version and the version that rides on the horse (Epona). Bid with confidence. Here is your chance to get the entire set loose. A must have for all Zelda fans. They are all loose but come in a poly bag. I don't know the validity of the story if these are actual pre-produciton samples, but I'm selling them as mint to near mint loose figures. All joints are tight and have never been on display. I took them of of a box they have been sitting in for over 10 years and just photographed them for the first time for this auction." Other Info: This figure was released as part of World of Nintendo series, and has some (but minimal) posable features. The same pose would be replicated and miniaturized in the Microland and Microland Deluxe World of Nintendo series as well as their 2.5" figure series.